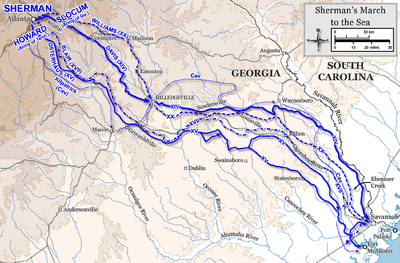 Sherman's March to the Sea (also known as the Savannah Campaign or simply Sherman's March) was a military campaign of the American Civil War conducted through Georgia from November 15 until December 21, 1864, by Maj. Gen. William Tecumseh Sherman of the Union Army. The campaign began with Sherman's troops leaving the captured city of Atlanta on November 15 and ended with the capture of the port of Savannah on December 21. His forces followed a "scorched earth" policy, destroying military targets as well as industry, infrastructure, and civilian property and disrupting the Confederacy's economy and transportation networks. The operation broke the back of the Confederacy and helped lead to its eventual surrender. Sherman's bold move of operating deep within enemy territory and without supply lines is considered to be one of the major achievements of the war and is also considered to be an early example of modern total war. 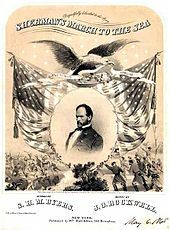 Sherman's "March to the Sea" followed his successful Atlanta Campaign of May to September 1864. He and the Union Army's commander, Lt. Gen. Ulysses S. Grant, believed that the Civil War would come to an end only if the Confederacy's strategic capacity for warfare were decisively broken. Sherman therefore planned an operation that has been compared to the modern principles of scorched earth warfare, or total war. Although his formal orders (excerpted below) specified control over destruction of infrastructure in areas in which his army was unmolested by guerrilla activity, he recognized that supplying an army through liberal foraging would have a destructive effect on the morale of the civilian population it encountered in its wide sweep through the state. The second objective of the campaign was more traditional. Grant's armies in Virginia continued in a stalemate against Robert E. Lee's army, besieged in Petersburg, Virginia. By moving in Lee's rear, Sherman could possibly increase pressure on Lee, allowing Grant the opportunity to break through, or at least keep Southern reinforcements away from Virginia. —  William T. Sherman, Military Division of the Mississippi Special Field Order 120, November 9, 1864. 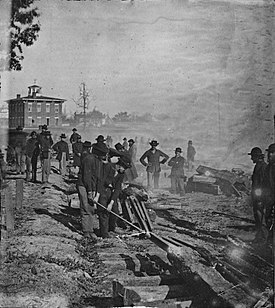 The march was made easier by able assistants such as Orlando Metcalfe Poe, chief of the bridge building and demolition team. Maj. Gen. William T. Sherman selected Poe as his chief engineer in 1864. Poe oversaw the burning of Atlanta, for which action he was honored by Sherman. Poe directly supervised the dismantling of all buildings and structures in Atlanta that could have provided any military value to the Rebels once Sherman abandoned the city; rail depots, roundhouses, arsenals and storage areas were manually disassembled and the combustible materials then destroyed by controlled fires (however, Poe was incensed at the level of uncontrolled arson by marauding soldiers not of his unit which resulted in heavy damage to civilian homes.) He served in this capacity past the fall of Atlanta to the end of the war. Dozens of river crossings, poor or non-existent roads and the extensive swamps of southern Georgia would have fatally slowed Sherman's force had not Poe's skills as leader of the bridge, road and pontoon building units kept the army moving. He also continued to supervise destruction of Confederate infrastructure. Promoted by Sherman by two steps in rank to colonel after the fall of Savannah, he continued in that capacity in the war's concluding Carolinas Campaign as Sherman headed northwards from Savannah to link up with Grant and the Army of the Potomac in Virginia and to cut another swath through South and North Carolina. ... We rode out of Atlanta by the Decatur road, filled by the marching troops and wagons of the Fourteenth Corps; and reaching the hill, just outside of the old rebel works, we naturally paused to look back upon the scenes of our past battles. We stood upon the very ground whereon was fought the bloody battle of July 22d, and could see the copse of wood where McPherson fell. Behind us lay Atlanta, smouldering and in ruins, the black smoke rising high in air, and hanging like a pall over the ruined city. Away off in the distance, on the McDonough road, was the rear of Howard's column, the gun-barrels glistening in the sun, the white-topped wagons stretching away to the south; and right before us the Fourteenth Corps, marching steadily and rapidly, with a cheery look and swinging pace, that made light of the thousand miles that lay between us and Richmond. Some band, by accident, struck up the anthem of "John Brown's Body"; the men caught up the strain, and never before or since have I heard the chorus of "Glory, glory, hallelujah!" done with more spirit, or in better harmony of time and place. According to a 2018 National Bureau of Economic Research paper which sought to measure the medium- and long-term economic impact of Sherman's March, "the capital destruction induced by the March led to a large contraction in agricultural investment, farming asset prices, and manufacturing activity. Elements of the decline in agriculture persisted through 1920." By employing the scorched earth policy that ripped through Georgia, Sherman demonstrated for the first time in the modern era the power of total war in breaking an enemy's will to resist. This concept would come into full bloom during World War II when both Axis and Allied powers deliberately and indiscriminately bombed enemy and enemy-controlled cities to create terror or disrupt war production in order to win the war by any means at their disposal—including extensive incendiary raids and the dropping of two atomic bombs. ^ Trudeau, pp. 47-48, 51-55. ^ Coffey, Walter. "The Civil War This Week: Oct 27-Nov 2, 1864". WalterCoffey.com. Wordpress. Retrieved 28 March 2015. ^ Henry Louis Gates, Jr., "The Truth Behind '40 Acres and a Mule' Archived 2013-06-23 at the Wayback Machine", The Root, 7 January 2013. ^ Eicher, pp. 793–94, 797–99, 831–35. ^ Parten, Bennett (2017). 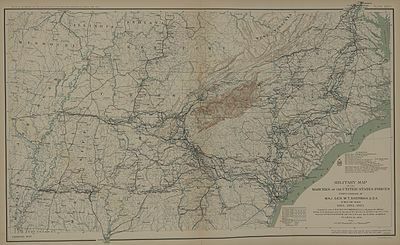 "'Somewhere Toward Freedom': Sherman's March and Georgia's Refugee Slaves". Georgia Historical Quarterly. 101 (2): 115–146. Retrieved 20 February 2018. ^ Feigenbaum, James J; Lee, James; Mezzanotti, Filippo (2018). "Capital Destruction and Economic Growth: The Effects of Sherman's March, 1850-1920". doi:10.3386/w25392. ^ GROCE, W. TODD (November 17, 2014). "Rethinking Sherman's March". The New York Times. Frank, Lisa Tendrich (2015). The Civilian War: Confederate Women and Union Soldiers During Sherman's March. Louisiana State University Press. ISBN 9780807159965. OCLC 894313641. Rubin, Anne Sarah (2014). Through the Heart of Dixie : Sherman's March and American Memory. The University of North Carolina Press. ISBN 9781469617770. OCLC 875742477. Secrist, Philip L. 2006. Sherman's 1864 Trail of Battle to Atlanta. Macon, GA: Mercer University Press. Whelchel, Love Henry (2014). Sherman's March and the Emergence of the Independent Black Church Movement: From Atlanta to the Sea to Emancipation. Palgrave Macmillan. ISBN 9781137405173. OCLC 864501780.